It gives me great pleasure to share with you the tremendous value I’ve received over the years from your colleague, Leah Vanpoelvoorde. As you know, Leah has served as my strategic thinking partner and coach. 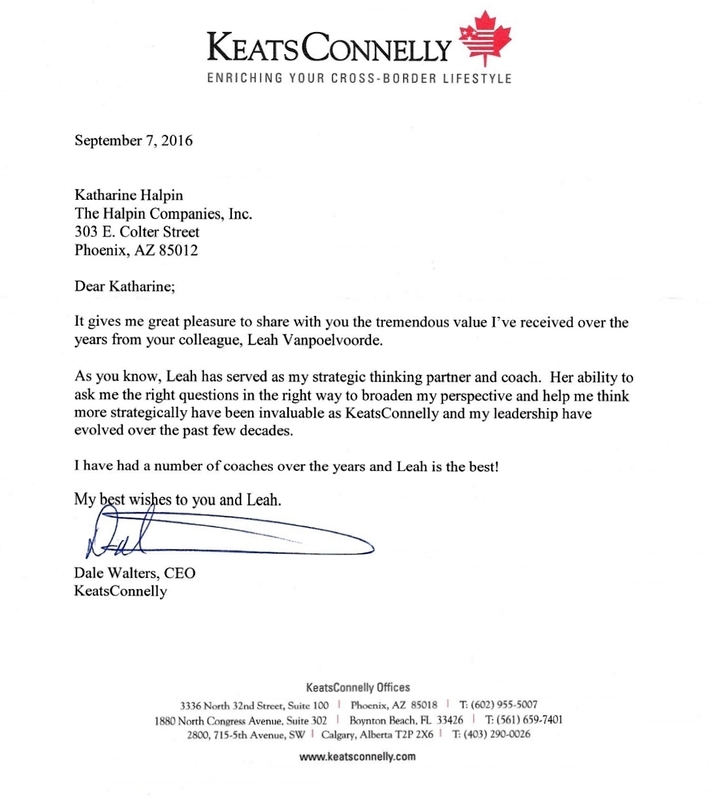 Her ability to ask me the right questions in the right way to broaden my perspective and help me think more strategically have been invaluable as KeatsConnelly and my leadership have evolved over the past few decades. I have had a number of coaches over the years and Leah is the best! At the beginning of a new decade and a new year, I have to take time to reflect. As the leader of a law firm that has enjoyed several decades of success and a great reputation, I had felt comfortable with the leadership I was providing and saw no real need to make any substantive changes in the firm. I was not aware of our potential growth opportunities. However, after our initial 90-day engagement, I could see how, using your methods, Baxter, Bruce & Sullivan can enjoy much greater financial success than was previously imagined. As a result of that initial engagement, we utilized your services to help prepare for our annual management retreat. WOW! Our pre-work with you allowed us to get the most important issues out on the table. Your tools then helped us get these issues fully resolved within 60 days. As a result, we anticipate not only increasing our productivity but realizing even greater client satisfaction in the New Year. More importantly, everyone is encouraged and engaged. With your support, I have strengthened my ability to be the strategic leader within the firm. I am confident that each of us will be exponentially more effective. This is a result of increase clarity, focus and alignment. We are laying the foundation for growth as a firm that will ensure that our success will continue for many years to come. Thank you for the behind-the-scenes role you are playing in our success. Baxter, Bruce & Sullivan P.C. 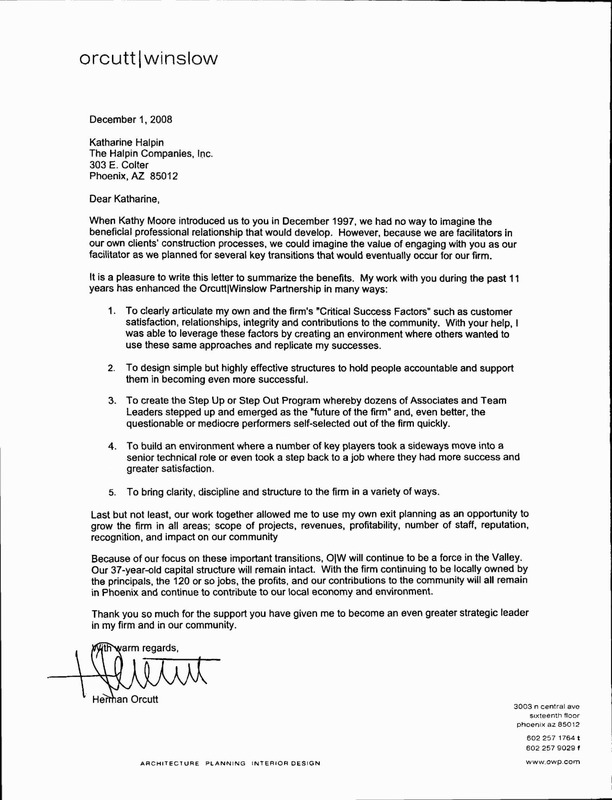 Prior to my work with Katharine, our company was successful and rapidly growing. However, at times we were chaotic, miscommunications popped up way too often, and project margins weren’t meeting goals. Also, some of our employees were not as productive as I wanted them to be. When I met Katharine, I assumed my only option was to upgrade my staff. Katharine, however, taught me how to communicate my expectations to my staff in a positive and clear manner. Understanding my expectations gave them the opportunity to rise to the new challenges. A few people did choose to “opt out” and left the company, but by communicating differently, the rest improved tremendously. Everyone is a lot happier, because they know where they stand. Clear communications had another positive effect: The new people we attracted to replace them were superior performers and better team players. Equally important were the “balanced life” skills Katharine taught my partner Jim and me. Both of us were worn out and stressed out because of grinding away all day, every day. Katharine coached us on specific ways to take care of ourselves given our workloads and responsibilities. I often quote one of her sayings that helps me: “Extreme self-care is the solution to all business problems.” Consequently, our energy has dramatically improved and we have a sharper focus at work. Another terrific result was that Katharine inspired and showed us that we could be bigger and better than we previously thought possible. With Katharine’s help, we have put in place a plan of sustainable growth for our company. Through Katharine’s guidance and coaching about clear and honest communication skills, we have already made substantial progress towards our goals. Thank you, Katharine! When Kathy Moore introduced us to you in 1997, we had no way to imagine the beneficial professional relationship that would develop. However, because we are facilitators in our own clients’ construction processes, we could imagine the value of engaging with you as our facilitator as we planned for several key transitions that would eventually occur for our firm. To clearly articulate my own and the firm’s “Critical Success Factors” such as customer satisfaction, relationships, integrity and contributions to the community. With your help, I was able to leverage these factors by creating an environment where others wanted to use these same approaches and replicate my successes. To design simple but effective structures to hold people accountable and support them in becoming even more successful. To create the Step Up or Step Out Program whereby dozens of Associates and Team Leaders stepped up and emerged as the “future of the firm” and, even better, the questionable or mediocre performers self-selected out of the firm quickly. To build an environment where a number of key players took a sideways move into a senior technical role or even took a step back to a job where they had more success and greater satisfaction. To bring clarity, discipline, and structure to a firm in a variety of ways. Last but not least, our work together allowed me to use my own exit planning as an opportunity to grow the firm in all areas: scope of projects, revenues, profitability, number of staff, reputation, recognition, and impact on our community. Because of our focus on these important transitions, Orcutt Winslow will continue to be a force in the Valley. Our 37 –year-old capital structure will remain intact. With the firm continuing to be locally owned by the principals, the 120 or so jobs, the profits, and our contributions to the community will all remain in Phoenix and continue to contribute to our local economy and environment. Thank you so much for the support you have given me to become an even greater strategic leader in my firm and in our community. I just wanted to drop you a quick note to say “thank you” for coming and spending time with us. I enjoyed it thoroughly and look forward to getting to know you better. I was impressed right from the get-go that you purposely invested time to get to know each of us personally to better understand our stories. Many would see that as a waste of time, inhibiting us from getting to the “real stuff.” But being the leadership development master that you are, you realized the “real stuff” can only be as effective as the foundation upon which you build. Awesome stuff. Thank you again, Katharine. Halpin Companies. We now have people in roles that are aligned with their strengths. You bring enthusiasm and energy to all of your endeavors. A note of gratitude for sharing your neat book, “Alignment for Success.” I even recognize some of it! Congrats on creating a concise, impactful product. Thank you for your facilitation of our succession planning efforts. 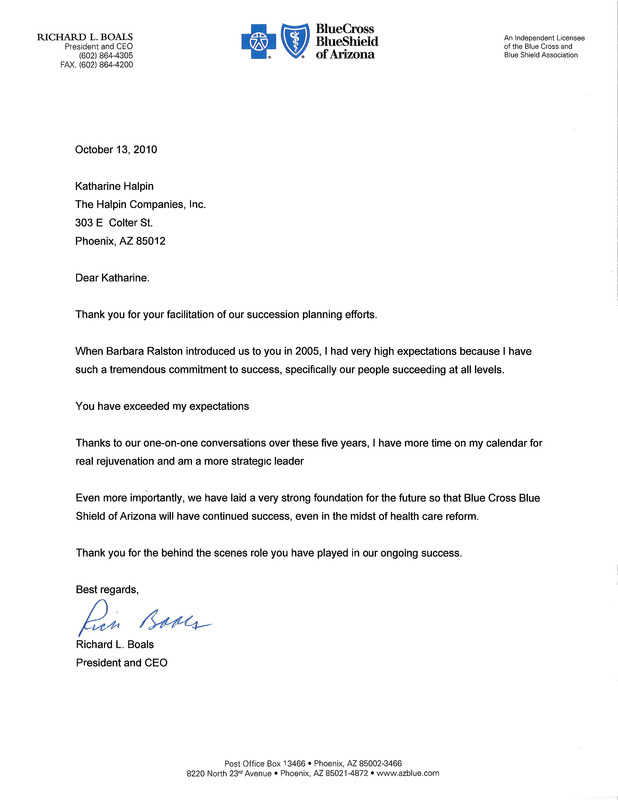 When Barbara Ralston introduced us to you in 2005, I had very high expectations because I have such a tremendous commitment to success, specifically our people succeeding at all levels. You have exceeded my expectations. Thanks to our one-on-one conversations over these five years, I have more time on my calendar for real rejuvenation and am a more strategic leader. Even more importantly, we have laid a very strong foundation for the future so that Blue Cross Blue Shield of Arizona will have continued success, even in the midst of health care reform. Thank you for the behind the scenes role you have played in our ongoing success. 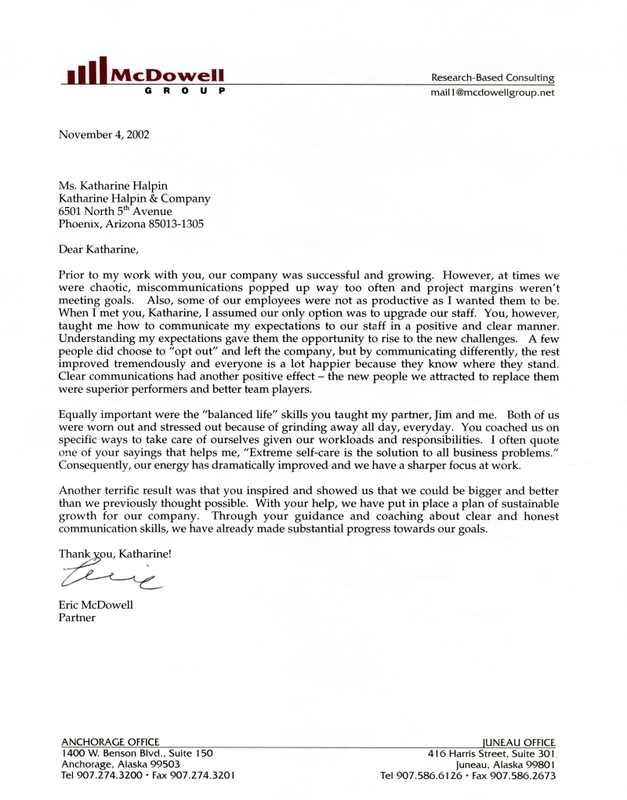 When I engaged your firm in November of 2008, I was experiencing a high degree of frustration. More importantly, our company’s success was taking a personal toll on my peace of mind. I was bordering on burnout. Like every leader in every company of a certain size & complexity, I had a million action items that all required my direct involvement & intervention. 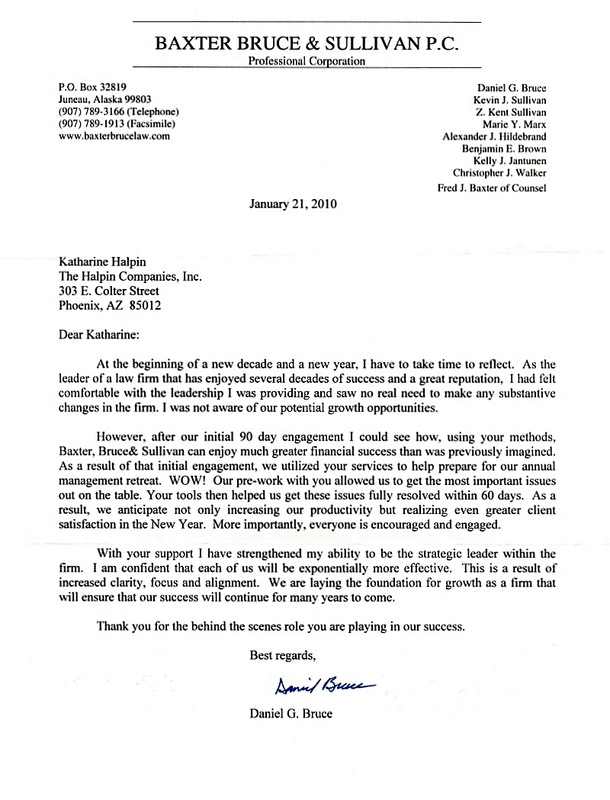 After working with you for only 60 days, I am pleased to report that my company has experienced record profit & productivity for the months of January and February, 2009. Additionally, all of my key players have demonstrated even more initiative, competence, and commitment to our company’s success. Lastly, I am sleeping better at night because I have a very short “to do” list. This gives me time to telecommute, vacation, and, most importantly, time to think strategically about how to continue to grow my greatest assets: this company and our team. Thank you for your behind-the-scenes role in our extraordinary success.